Through Kardias Ministries, we have been able to connect with several Sabbath keeping groups in India. Widows in India are particularly oppressed, and we are happy to have been able to supply a group of them near Kakinada, India with both equipment and financial support. In the Summer of 2008 we helped to sponsor a young man on a life changing mission trip with Kardias Ministries to India, during which he was able to meet with and serve several of the widows mentioned above and also a large group of orphans in and around Chennai. Visit the Gampala Family Ministries page on the Kardias Ministries website for more information on these groups. Orpahns with their new lessons. One of our main outreach efforts is to support Christian Sabbatarians in Kenya who care for about 50 orphans. We have been able to supply them with weekly sermons via email, sponsor their annual Fall Festival (the Feast of Tabernacles), and when possible send financial support for both our Kenyan brethren and the orphans in their care. The Kenya Project started when a diverse group of people from Kenya set out to find God's Truth - and someone to teach it to them. This small group was made up of both families and orphans that came from various faiths and religious backgrounds. Because of the differences in dogmatic doctrine from each of their various religions they knew that they did not have a clear understanding of what the Truth of God (the Word of God) really was. Through the wonders of the internet, our Kenyan friends found the Church of God, Colorado. After carefully reading the Statement of Beliefs from the Church of God, Colorado's web site they were confident they had found someone who could teach them God's Word without the clutter of man made doctrines that tended to divide people. Eventually, our Kenyan brethren recognized and began to keep God's weekly Sabbath. We knew that Christian Educational Ministries had an exceptional youth program - Youth Educational Adventures (YEA). All three groups (CEM, the Colorado Church of God, and the Church of God Terre Haute) agreed to work together and to provide YEA lessons for the youth in Kenya - many of whom are orphans. CEM shipped YEA lessons and Teachers Manuals to Kenya. Both CEM and the Church of God Terre Haute have received cards, letters of thanks and pictures from our dear friends in Kenya. In a letter from one of the instructors the comment was made that they completed all of the workbook portion of the lessons except for the part that required crayons - because they didn't have those supplies. With a bit of effort and a lot of love, several members of our congregation were able to obtain colored pencils and other supplies for the orphans so that they were able to complete their workbooks and other activities. 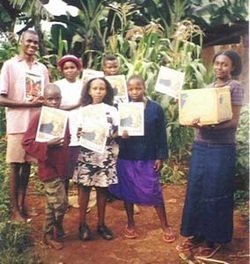 Information on Terry Bruns' visit to Kenya in 2005 is available here, and you can visit our Kenyan brethren's home page here.